Five years. That’s how long ago it was since my mother-in-law and I stood just a block away from the Boston Marathon finish line as the first bomb went off. Part of me wishes that I didn’t remember every sensation of those moments as we heard the explosion, felt the ground shake beneath our feet and saw the huge plume of smoke rise into the air as the cries of confusion, and eventually horror, met our ears. Even as I write this, my heart is pounding and tears are welling up in my eyes. I will never forget it. And I refuse to do so. Because the families and friends of those who died, and the victims who still live with the reality of their injuries and memories certainly will not forget. That’s one of the reasons we have returned each year since the bombing. To honor the victims. To honor the resilience of the people of Boston and the running community. So, we are here today, lined up along Boylston Street, ready to cheer on my husband and all of the other runners in this year’s Boston Marathon. If you would like to read about my recollections of that day in 2013, see this post. And this post talks about the redemption that the 2014 marathon brought. And what does all of this have to do with steamed clams? 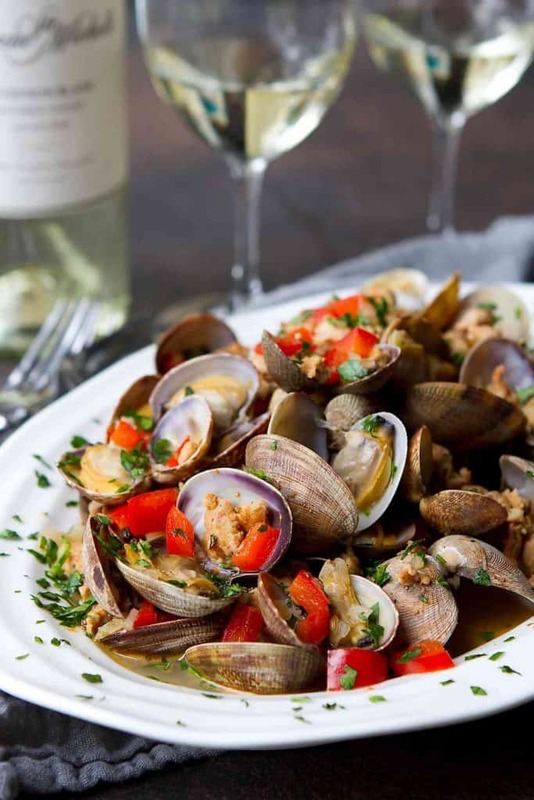 As bumpy as the transition is from the Boston marathon to clams, I chose to share this recipe today because when I think of the Boston restaurant scene, my mind goes straight to seafood, particularly lobster rolls, clam chowder and cioppino (and Italian-American fisherman’s stew). While I adore the taste of steamed clams, it’s the broth, a combination of white wine and the juices from the clams, that is the real star of the show. 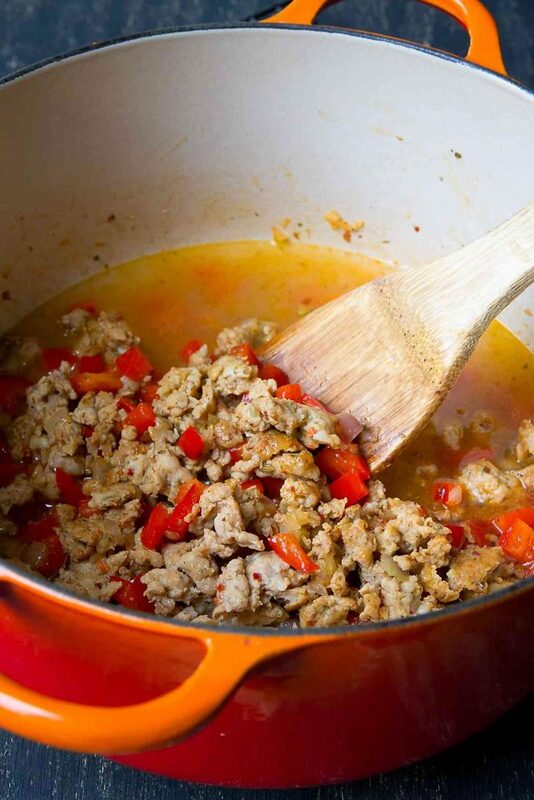 The best way to enjoy it is by dunking toasted pieces of baguette into the broth, scooping up pieces of Italian sausage and red bell pepper with each bite. That being said, I have been known to slurp up the broth with a spoon if there is no bread in sight. Before steaming clams, it’s a good idea to soak them in cold water for 30 to 60 minutes to allow the clams to spit out any sand. Rinse the clams well and discard any that are cracked or open. If there is an open clam, try tapping it on the counter. If it closes, it’s okay to use. Otherwise, pitch it in the garbage. Cook any aromatics in a saucepan. In this recipe, that’s sausage, red bell pepper and shallots. Add about 3/4 cup of liquid (for 2 pounds of clams) to the saucepan and bring to a boil. 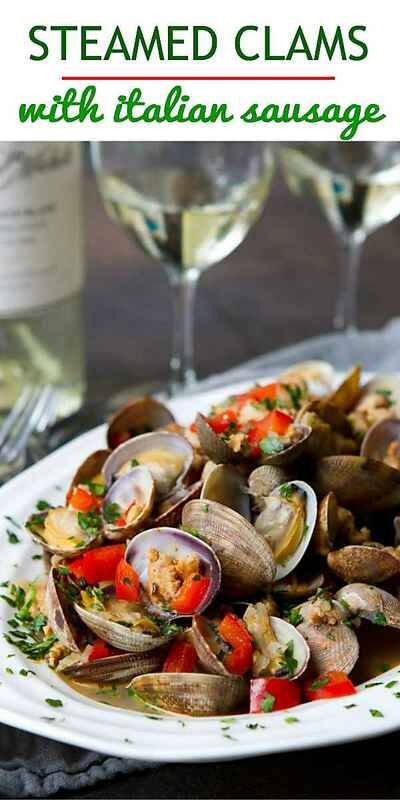 White wine imparts fantastic flavor in this recipe! Place the clams in the saucepan, cover and allow to steam for 7 or 8 minutes. Discard any clams that don’t open. Serve the clams with any accumulated liquid. Heat a large saucepan over medium-high heat. Lightly coat with cooking spray. Add the sausages and, using a wooden spoon, break up the sausages as they cook. Once the sausage have browned and cooked through, move them to one side of the saucepan and turn the heat to medium. Add the olive oil to the empty part of the saucepan, then add the red bell pepper, shallots and salt. Cook, stirring occasionally, until tender, 3 to 4 minutes. Stir the mixture together with the sausage. Pour the white wine into the sausage mixture and bring to a boil. Add the clams to the saucepan, cover and let steam for about 8 minutes, or until the clams have opened. Discard any clams that have not opened. Transfer to a serving bowl and garnish with parsley. Serve with toasted baguette pieces, if desired. 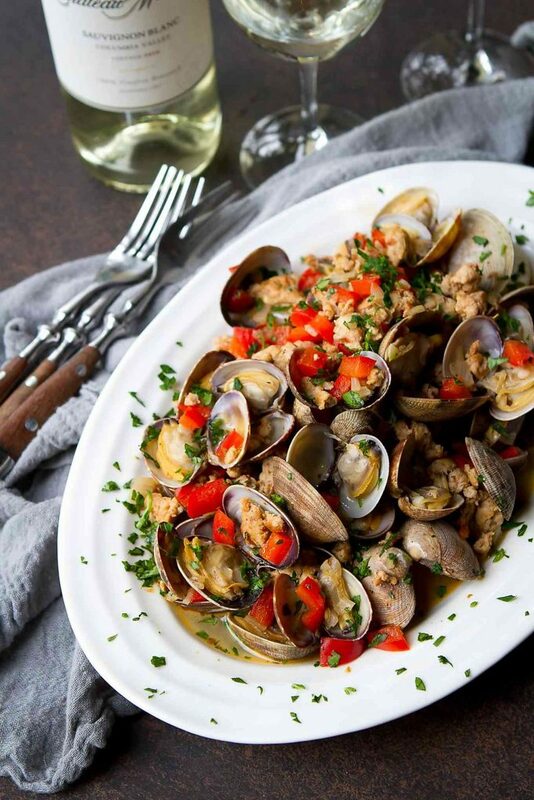 *Before steaming clams, it’s a good idea to soak them in cold water for 30 to 60 minutes to allow the clams to spit out any sand. **Baguette pieces not included in nutritional information. This is a wonderful recipe. Unfortunately, living in Oklahoma, I can’t get my hands on good, fresh clams. But, that’s why we travel! I am obsessed with this combination! I gotta try! I love anything with Italian sausage so yeah…I am going to love this! We will never forget that tragic day! So glad your husband was able to participate in this year’s Boston Marathon. What a gorgeous appetizer! This looks so delicious! I wish my family liked clams. I only get them on occasions where I am at a seafood restaurant because I won’t make them just for me to eat. I love all the protein in this dish!! !